This entry was posted on Wednesday, March 31st, 2010 at 8:07 am and is filed under Uncategorized. You can follow any responses to this entry through the RSS 2.0 feed. You can skip to the end and leave a response. Pinging is currently not allowed. 101 Responses to Today is a very special day…. Never WATH, Never….. Hope he rests in peace and gets to see a true Arsenal performance later…. RIP Rocky…still the only player I have a ‘best of’ video cassette! Not even Bergkamp or Henry got that Rocky! True legend and my first ever favorite player 🙂 tonight will hopefully be for you…. Top post Rico………….!! That clip is enough to choke anyone up…! We need that grit and determination 2nite along with the passion and attitude of wanting it soooooooooo bad….!. Lets hope your up there smiling lata Rocky…!. Here here Erick… I hope the club remember his passing tonight.. They should play that clip b4 the game 2nite…….. That may liven the crowd up…! Remember being at Old Trafford for the FA Cup game against Spurs and the minutes silence being impeccably observed. Just thinking about that, and the huge roar that followed and the constant singing of his song makes my eyes water and my spine tingle. Thats before I even think about the game and result itself! Currently based overseas and have been in the office for the last 4 hours unable to concentrate – cannot wait for the game, if for nothing else then just to settle the nerves down with a pint! Jealous of all you Gooners heading down there! And in the dressing room WATH..
Wonder if any of Rocky’s family will be going to the match? Thanks LF, reading your comment makes the eyes sting, even after nine years…..
LF the mins silence was the league game the week before at Highbury…! 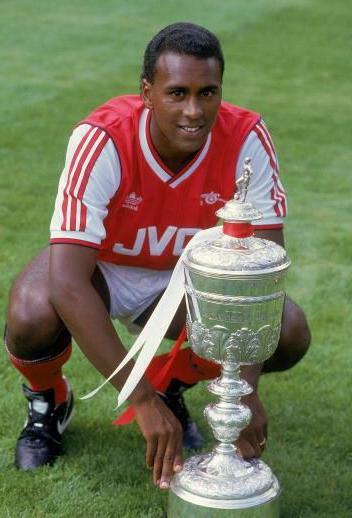 I wasn’t following football during Rocky’s time at Arsenal but, wow, what a player, what a man. RIP Rocky. I am sure you will be watching among us tonight. God bless. I remember a cracker he scored from about 30 yards at Old Trafford. I was so excited, I ran into the back garden shouting YES YES YES!!!! I didnt care if all the neighbours thought I was crazy. Its a strange old day Erick, yesterday I was so excited about tonight, elated over the mancs losing and rooney picking up a niggly injury, yet today having time to reflect on the big man Rocky, it kind of puts life back into perspective – just how does such a young family get over losing a father and husband…..
well done RSD and well done rico. a very fitting tribute to a legend! I have to go out to work again now where there are no computers, but I will try to get on later. LF………. My apologies…. Got in late to the semi didnt know they did another mins silence….! The roar was good but nothing like the one early in the 2nd half…..! remember that one…! made the hairs on the back of ur neck stand up and go all cold…..! One of those moments that live with u 4ever…! Erick, maybe too deep, sorry …. Mornin Ave, take it easy mate…! Not 2 deep at all Rico, spot on actually……!. Wonder how many of the current lot would cry if they were told they’d been sold…. A very valid point….!. Show’s how much the club really mean’t to Rocky it’s also why we could relate to him so easily… He was one of us simple as that, you can’t say that about any of the squad now…!. i love the intro rico. Thanks wath, when cesc came on against villa, scored his goals, i saw tears in his eyes, he may not be london born, he probably won’t ever feel for the club the way that Rocky did, but he sure as hell cares… but he is an exception to the rule imho…. Morning Suhail, good to see you again..
have know idea how you sign in via wordpress either rico. I agree Rico, Cesc cares and a few others to be fair but they don’t care like Rocky did or a few others from that time….! When we lose it ruins my weekend, my week I don’t wanna talk to people I dont wanna go out or be sociable…. I am grumpy cos it hurts so much….! I don’t think todays players feel like that at all and yet 20/25yrs ago I would say they did…!. Money and greed change many things…! Nice to see u 2 rico, great post, he’ll be remembered for ever. We lose, I hurt, big time!! Thanks Suhail, rsd must take the credit though, he did all the research – did you ever get to see Rocky play? Am not that lucky rico, or i don’t remember as was a kid that time. But heard lot abt that 5star arsenal team and its english idols. I never saw him in the flesh sadly, only on television/dvd etc..
Wat abt todays match, be inspired and beat barca. Suhail, a pre match post will go up around 3pm, will you be around for the game stuff? I will try, i got another stuff.. Am exam tomorrow. so whats this balcony garden plan? we have a day bed on ours and with a 2/1/2 year old running round plants dont get much of a chance unless there hanging. the orchid survived but only after it had its leaves shredded. greetings all, not long now, biggest game of the year! Classic Arsenal vs Liverpool game from 03/04 season on foxsports 3 as we speak. Not hard to remember the 4-2 Gooner result in that one! henry 3rd goal was sublime, carragher turned inside out and nutmegged a ripper! can i be bother to go do any work today no! Arsenal have kept six successive clean sheets at home to Spanish opposition. gotta hit the sack for the 5.45am kick off, see you all then! Arsenal have kept six successive clean sheets at home to Spanish opposition. what are they? how very le grove you today! good news on nn rsd..
Wondering………………… lager, win, vodka or whisky……… decisions decisions..! yeah for arse news check them out spec if you have twitter and even more if run tweetdeck cos arse news just flashs up on your screen. a screen of flashing arse. I think ur right Rico a pint of each in no particular order………..! Afternoon Erick…..! like to do 3 or 4 at once! i also like to blog! Water is for girls Rico….. Off out too… the time has cometh………….! Cheers all….! see ya 2moro…!